The Hard Rock Café started as a craving for some good American grub and a passion for rock'n'roll, and it has grown to be a destination for millions of people around the world, whether they are on vacation or just out for dinner with the family. 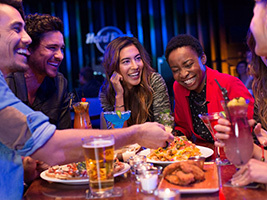 With a total of 138 cafes around the world, Hard Rock is a haven for fans of music, food, and great times. Beginning with an Eric Clapton guitar, Hard Rock owns the world's greatest collection of music memorabilia, which is displayed at its locations around the globe. Rock Walls, Surface tops and Booth Interactive, touchscreen technology allows guests to check out the best pieces of the memorabilia collection, even if it's currently on a wall in another country. Acoustic - Choice of Entrée (choose one): Hard Rock 6oz Cheeseburger or Bacon Cheeseburger, Hickory Smokehouse Sandwich or Texan, entree salad or sandwich. Dessert: Chef's Dessert. Choice of Beverage (choose one): Coffee, Tea, or Soft Drink. Electric - Choice of Entrée (choose one): Fajitas (chicken, steak or shrimp), grilled salmon, burgers or sandwiches, smokehouse hickory chicken, smoked ribs OR duo platter, twisted chicken mac and cheese (all entrees are paired with listed side items per menu). Dessert (choose one)t: Apple Cobbler, Cheesecake (both served with coffee or tea). Choice of Soft Drink. Others: Valid for walk-in only. No reservations. Includes tax, gratuity and menu items specified within menu purchased. Menu items cannot be substituted and are subject to change.